Amrit Vayu Equipments Private Limited wide and exclusive range of Air Dryers. These products are manufactured by our team of professionals, who make use of premium quality raw material which is obtained from authentic vendors of the industry. Furthermore, we make these dryers available to the customers in varied sizes and specifications, at industry leading prices. 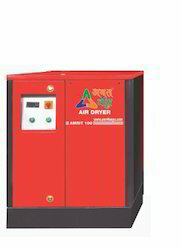 In addition to this, Amrit Vayu Air Dryer is widely appreciated by the clients for its durable standards, functional efficiency and high performance. Since the inception of our company, we manufacture and supply the optimum quality of Refrigerator Air Dryer. Energy efficient design, consistent performance and low maintenance, makes the refrigerator air dryer highly demanded. Our customers can avail the refrigerator air dryer in various technical specifications, in accordance to their needs and requirements. High performance, reliable and trouble free. Dia10 mrn one touch condensate drain port.